The best social network you’ve (probably) never heard of is one-five-hundredth the size of Facebook. It has no video chat feature, it doesn’t let you check in to your favorite restaurant, and there are no games. The company that runs it has just four employees, one of whom is responsible for programming the entire operation. It has never taken any venture capital money and has no plans to go public. Despite these apparent shortcomings, the site’s members absolutely adore it. They consider it a key part of their social lives, and they use it to forge deeper connections with strangers—and share more about themselves—than you’re likely to see elsewhere online. There’s a good chance this site isn’t for you, but after you see how much fun people have there, you’ll wish you had a similar online haunt. The social network is called Ravelry. It’s for knitters (and crocheters). Ravelry’s success is evidence in favor of an argument that you often hear from Facebook’s critics: A single giant social network is no fun. Social sites work better when they’re smaller and bespoke, created to cater to a specific group. 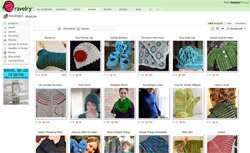 What makes Ravelry work so well is that, in addition to being a place to catch up with friends, it is also a boon to its users’ favorite hobby—it helps people catalog their yarn, their favorite patterns, and the stuff they’ve made or plan on making. In other words, there is something to do there. And having something to do turns out to make an enormous difference in the way people interact with one another on the Web. Radio Drama Revival is a wonderful site and worth a visit (or 2 or 3). I hadn’t realized until last night when looking for Heinlein’s short story that the radio play was available online. I heard this when it was broadcast on NPR years ago and had been looking for the print version ever since. Unfortunately, I did’t have the sense to write down the author or the name of the radio play at the time, so I’ve been hunting fruitlessly. An acquaintance at a somewhat weekly coffee gathering here in Santa Fe was able to identify the story when I described the radio show and gave me the title. I was immediately able to locate the print version, which can be found in pdf format here: www.xs4all.nl/~pot/scifi/byhisbootstraps.pdf. Had I waited another week to search, I might have found this 2010 blog post and the audio file. Enjoy – in either format! WOW. This week I have the great pleasure of presenting to you, rendered in brilliant stereo sound, this gem of a short story by the grand master Robert A. Heinlein, By His Bootstraps. We again have to thank the esteemed Yuri Rasovsky, who produced these works for the Beyond 2000 series which aired on NPR. You can download many many more stories from this collection on Audible – search for 2000x.